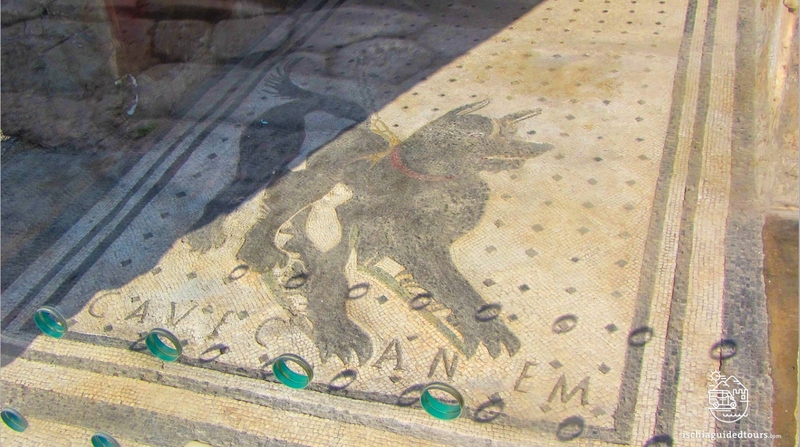 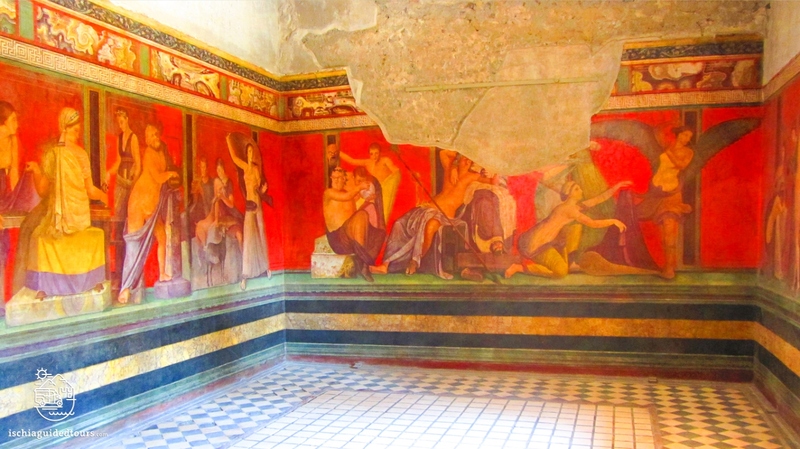 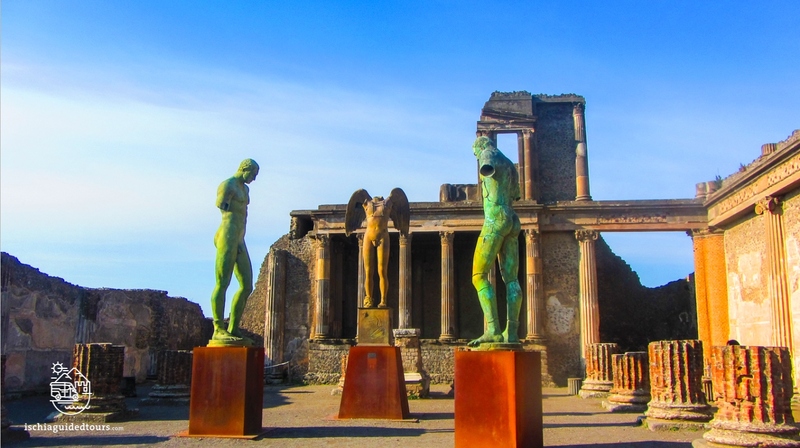 Pompeii, Herculaneum and Mount Vesuvius, three places with a dramatic bond and connected by a tragic fate that left such an important heritage in history. 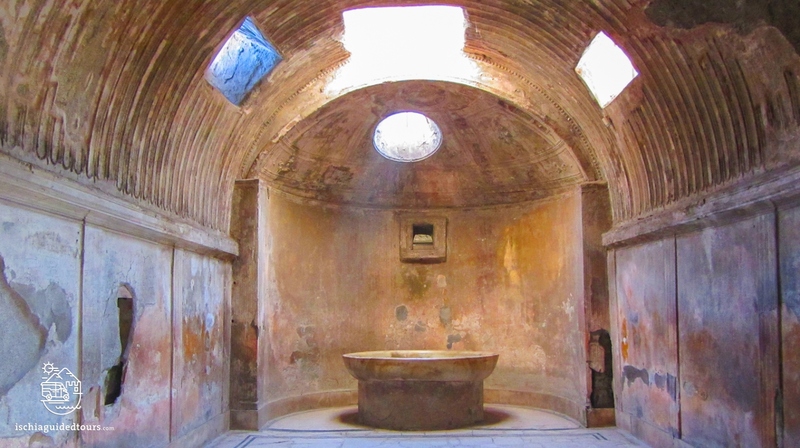 It was 79 A.D. when a massive eruption of Mount Vesuvius destroyed the Roman cities of Pompeii and Herculaneum, burying them under 30 feet of pumice, volcanic ash and mud. 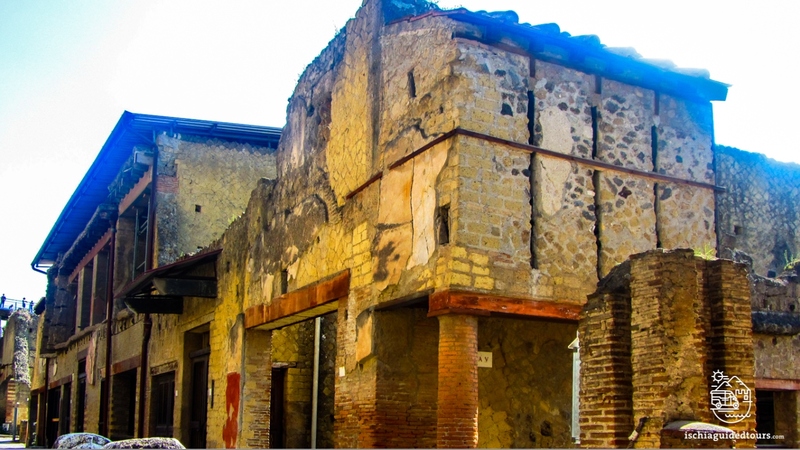 Both cities were abandoned after the tragic disaster and forgotten, until archaeological excavations brought them back to life in the XVIII century. 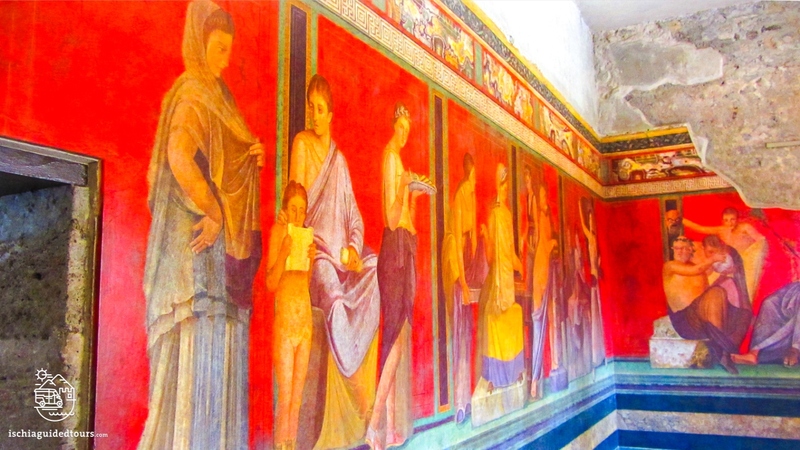 Pompeii and Herculaneum represent unique examples of Roman cities still preserved as they were almost 2000 years ago, with their buildings, temples, several types of shops (laundries, bakeries, blacksmiths, shoemakers, and many more), thermal baths, taverns, hostels, luxury villas and entertainment places such as an amphitheatre, theatres, and even brothels, all frozen in time. 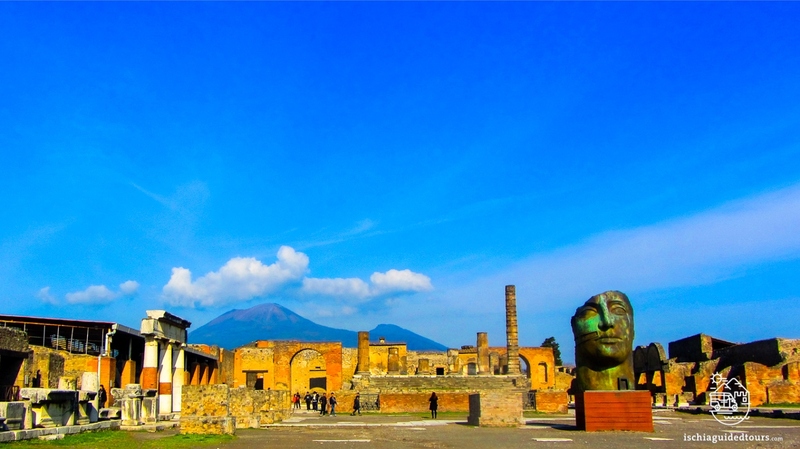 Pompeii was a thriving commercial center, a sea port city located on a strategic point in the Mediterranean, inhabited by around 15,000 people, and where traders exported and imported goods to different countries in Africa and Asia. 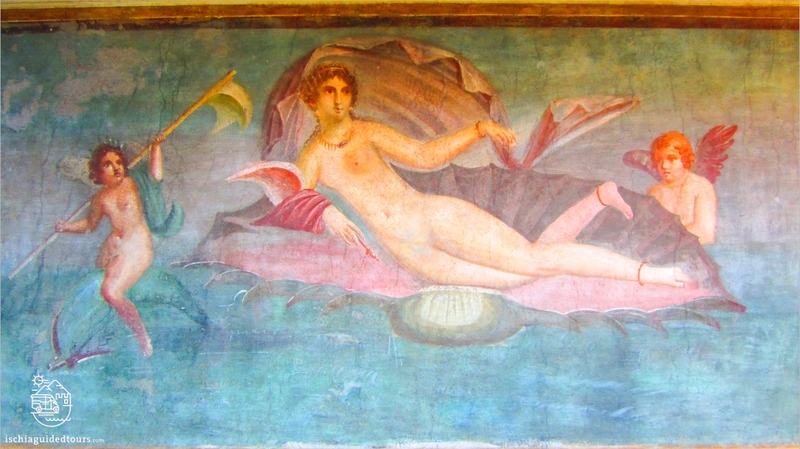 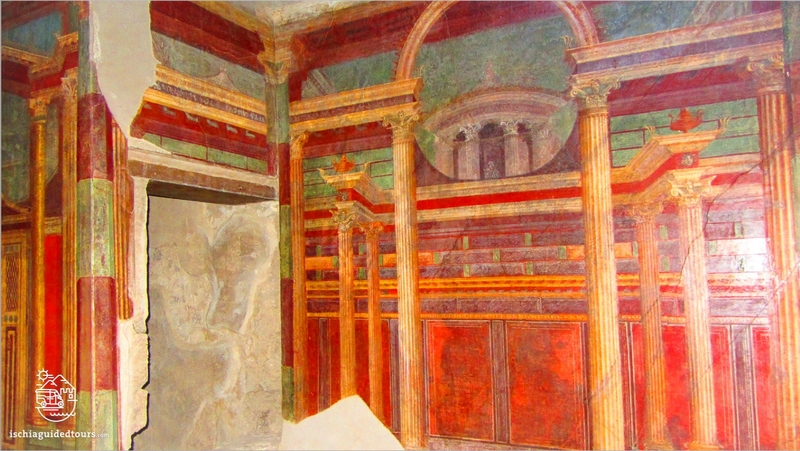 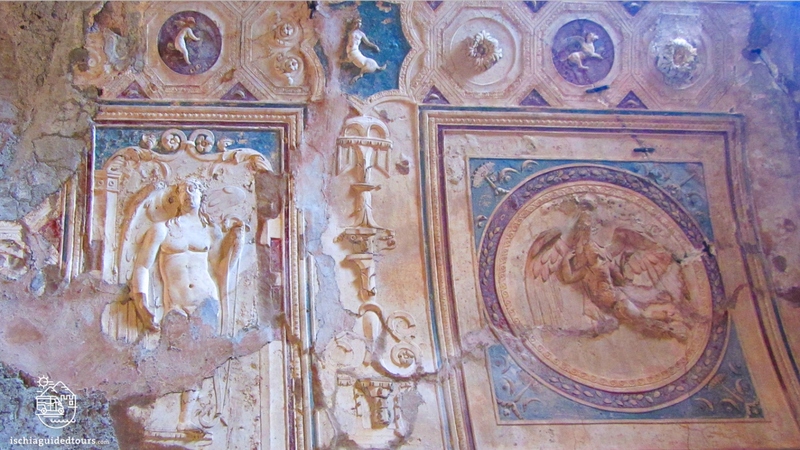 Herculaneum was mainly an aristocratic seaside hamlet inhabited by around 5,000 people, where the richest Romans loved to spend their holidays and free time in their ville d’otium (leisure villas), overlooking the sea. 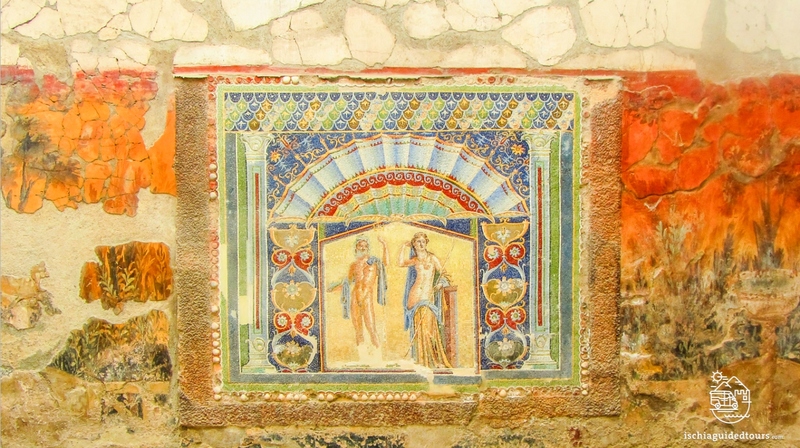 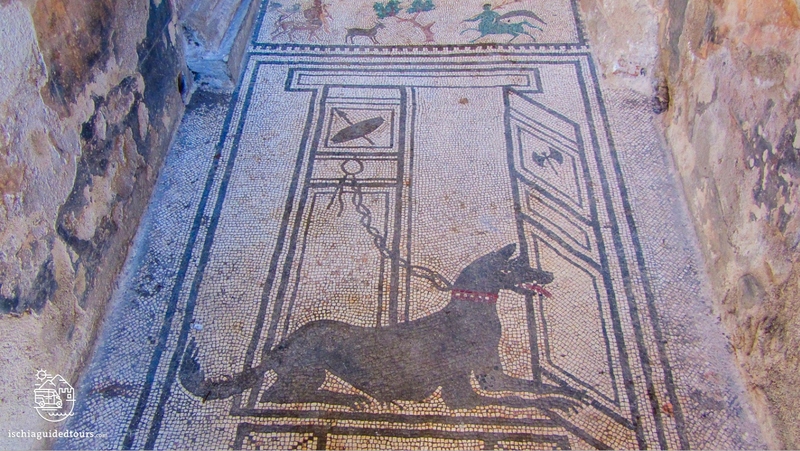 Both cities were surrounded by opulence and luxury: the refined taste and love for the figurative arts of the residents is visibile in the amazing frescoes, mosaics, marble statues and decorative objects in their domus (the typical upper-class Roman house); precious materials such as gold and silver were used for jewellery or every day tools such as oil lamps or kitchenware. 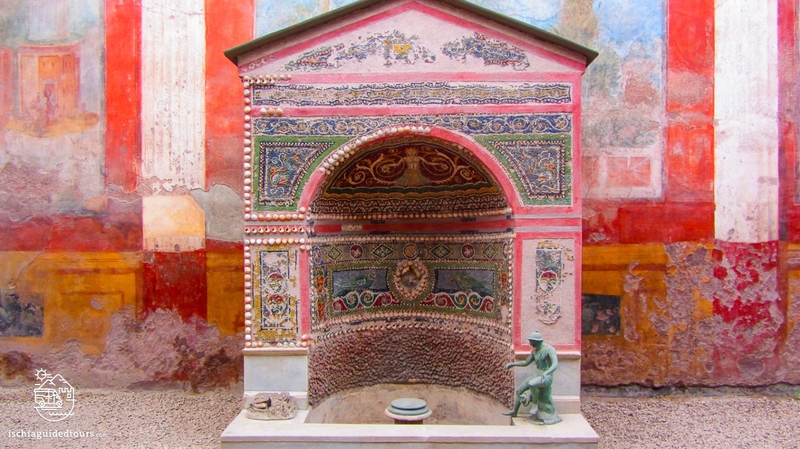 In Pompeii, archaeologists managed to produce through a very delicate process something quite unique, the replica of the dead bodies perished under metres of hardened ash and volcanic rocks. 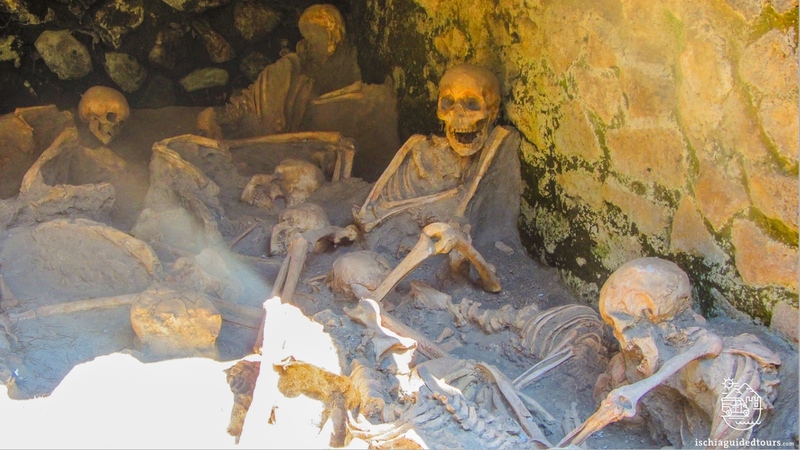 The archaeologist Giuseppe Fiorelli realized that, under the soil, empty cavities were left by the decomposed bodies of the victims. 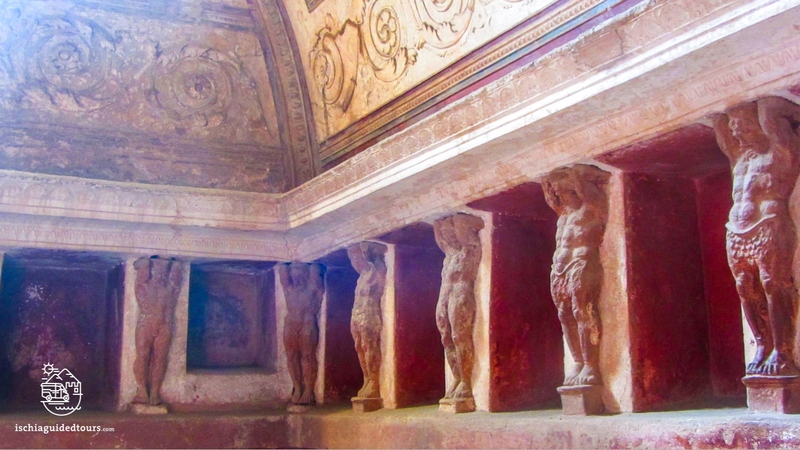 He had the brillant idea to fill the empty cavities with liquid plaster to recreate the shape of the corpses at the exact moment of their deaths. 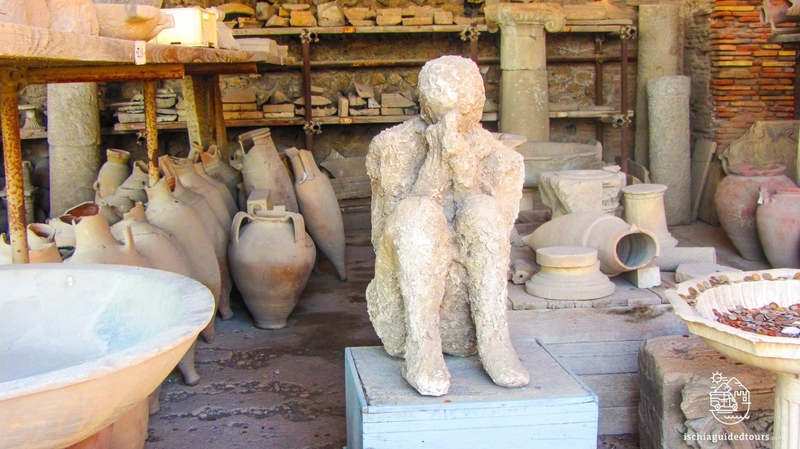 It is an incredible experience to look at these plaster casts where, in some cases, the fear and despair of the victims can be clearly seen. 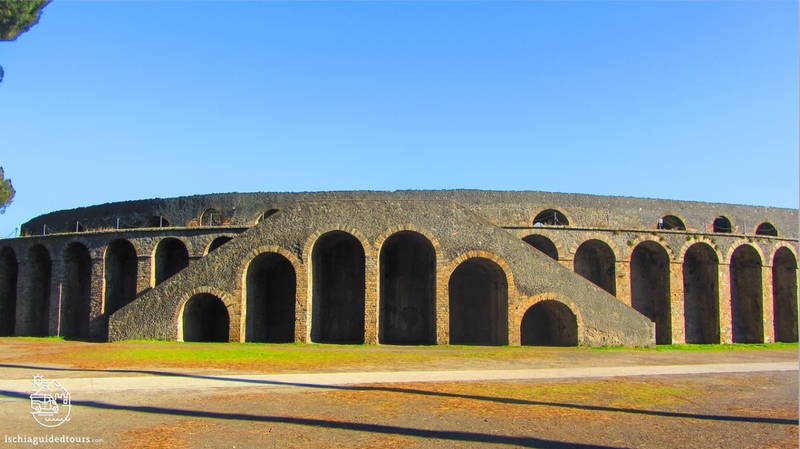 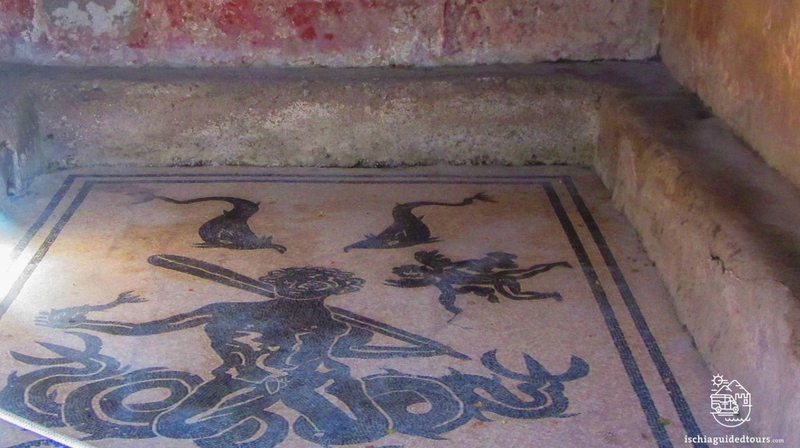 Visiting Pompeii and Herculanuem gives a unique insight into the ancient Roman life. 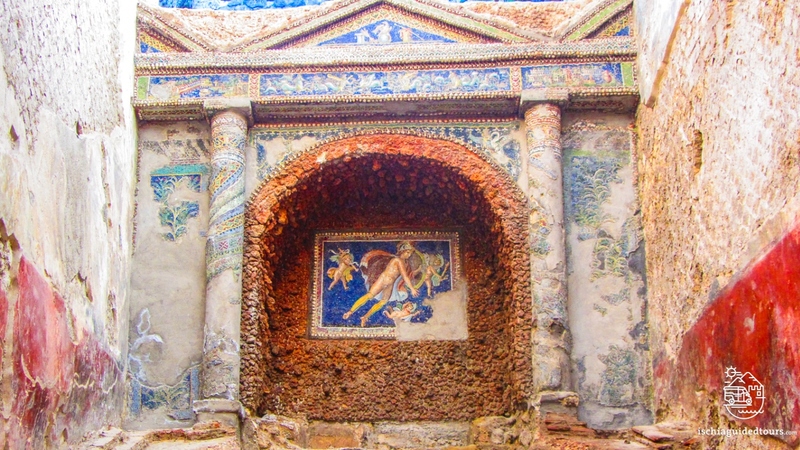 It is possible to get a clear picture of the every day life of, for example, a common slave, a gladiator or a local politician, through the thousands of notes left in the form of graffiti on the walls. 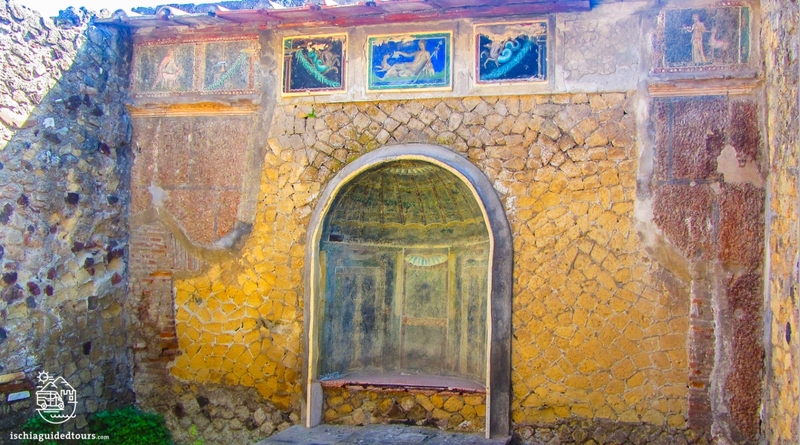 You can also learn about the daily routines, jobs and earnings of the people of the city, from the elegant matrona (the wife of a wealthy and powerful man) to the owner of a local tavern, or a rich merchant, through the objects found in their dwellings. 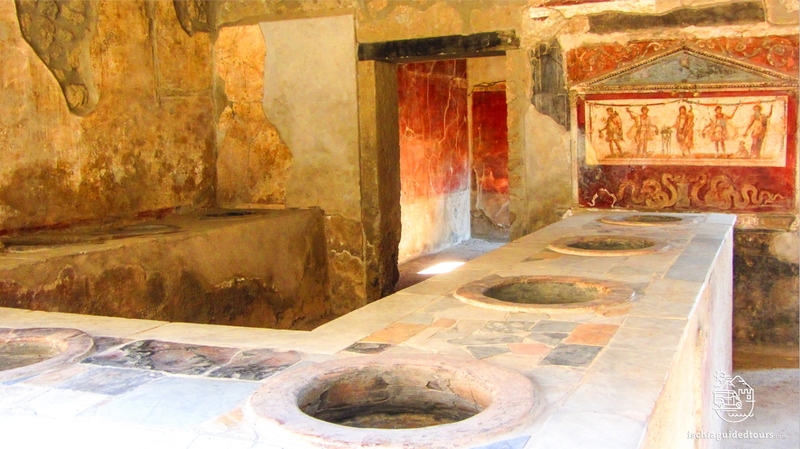 The numerous carbonized products found in the excavations, such as loaves of bread, eggs, vegetables or fruits also give us an idea of the eating habits and the diet of the different social classes. 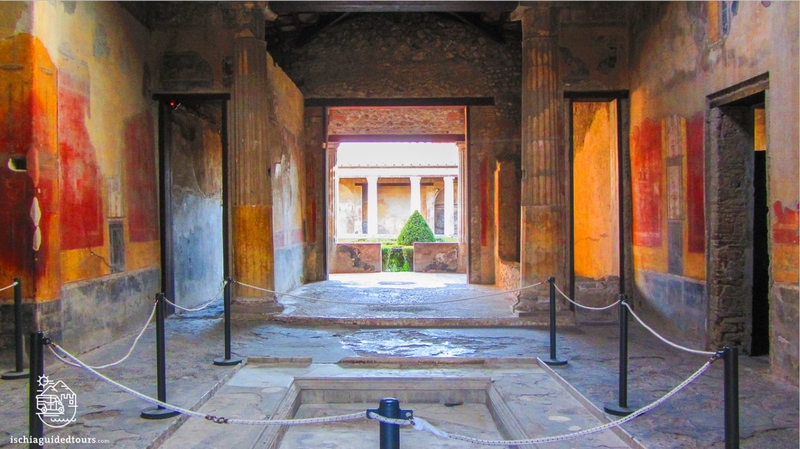 While 3/4 of the city of Pompeii has been excavated so far, most of the old city of Herculaneum still lies underneath the ground, right below where the new, modern city has been built. 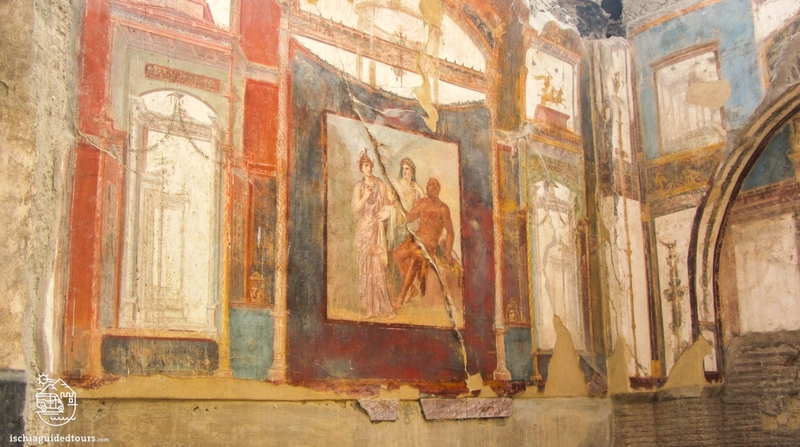 Although it is almost entirely covered, the archaeological site of Herculaneum represents an exceptionally well preserved site because, in the second phase of the eruption of Mount Vesuvius, it was inundated, not by volcanic ash or rocks like what happened in Pompeii, but by a flow of hot volcanic mud that filled every cavity of the city, to create a compact seal which lay undisturbed for 2000 years. 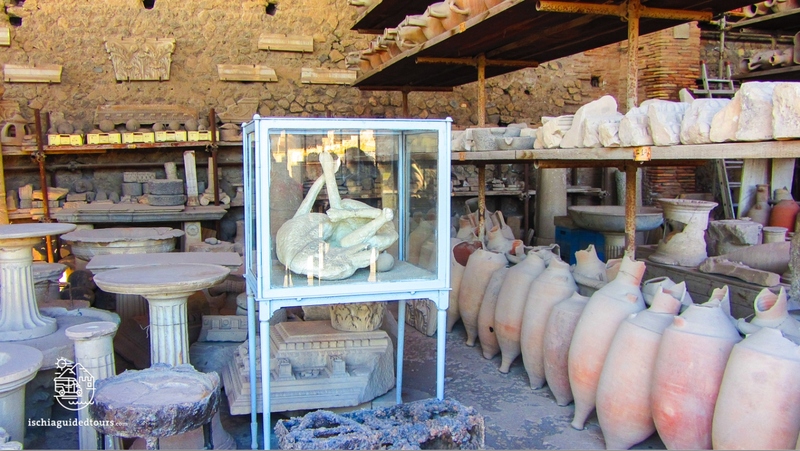 As a result, organic materials such as wood, fabric and even paper, carbonized by the hot mud, have been found here. 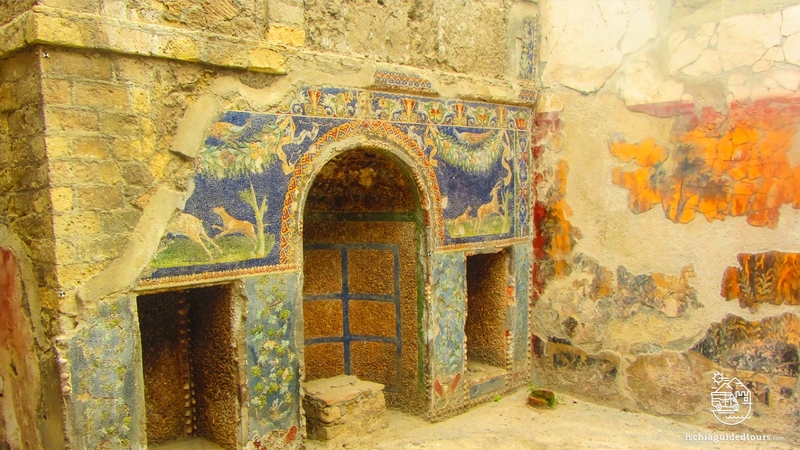 In Herculaneum you can also see pieces of ancient furniture, tables, wooden beds and doors that were part of the opulent residencies. 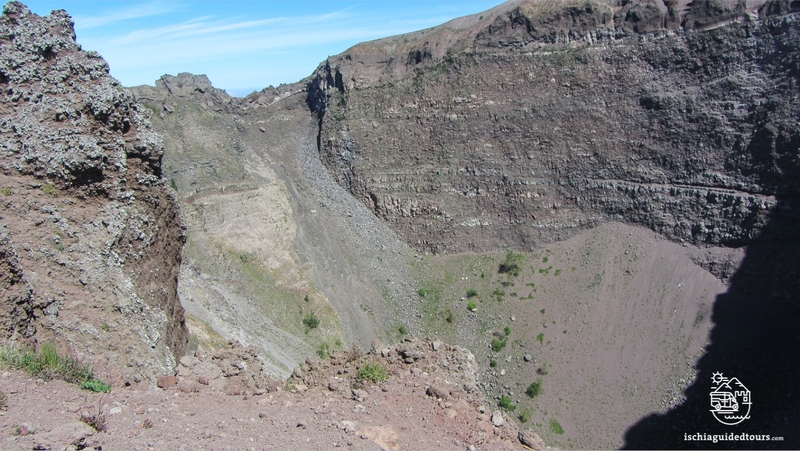 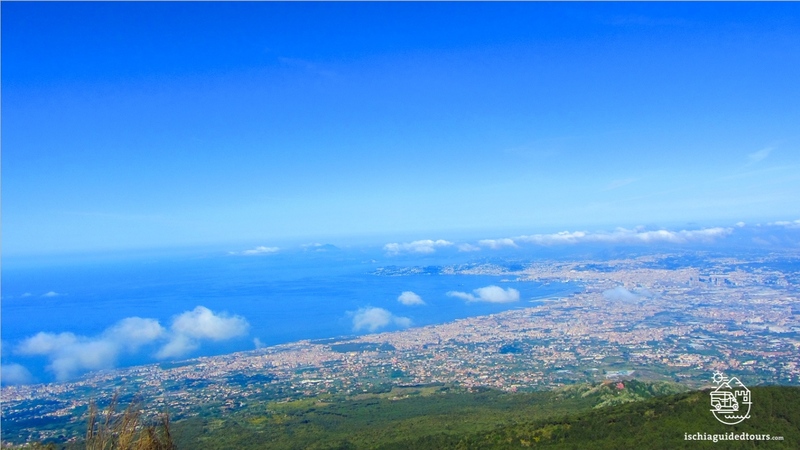 Mount Vesuvius has erupted several times since that terrible eruption in 79 A.D., the last of which occurred in 1944. 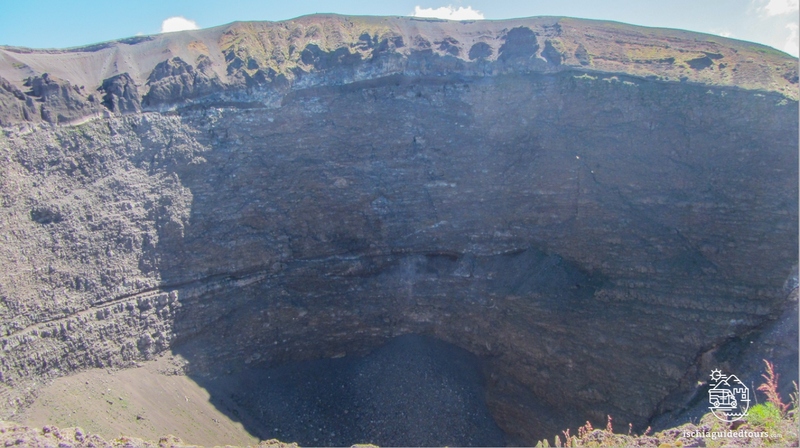 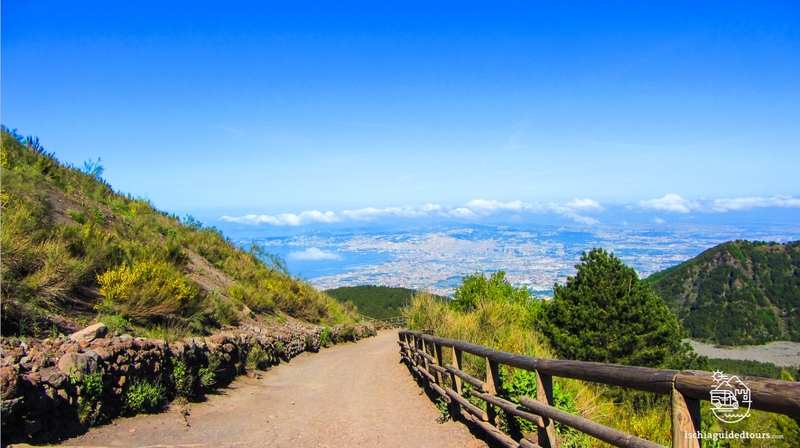 The volcano, about 5 kms from Herculaneum and 8 kms from Pompeii, stands in the middle of the Vesuvius National Park and the hike to reach the crater is definitely worth the effort. 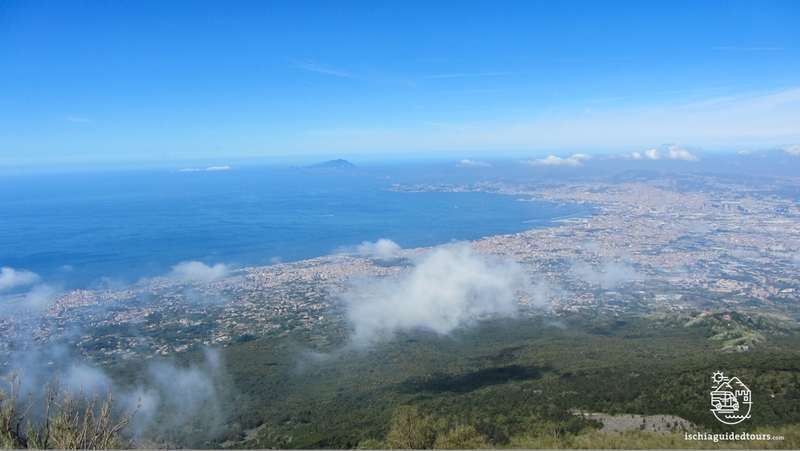 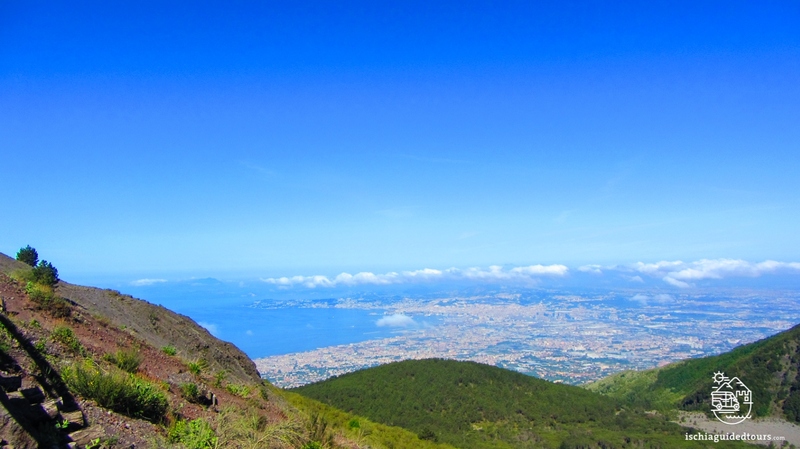 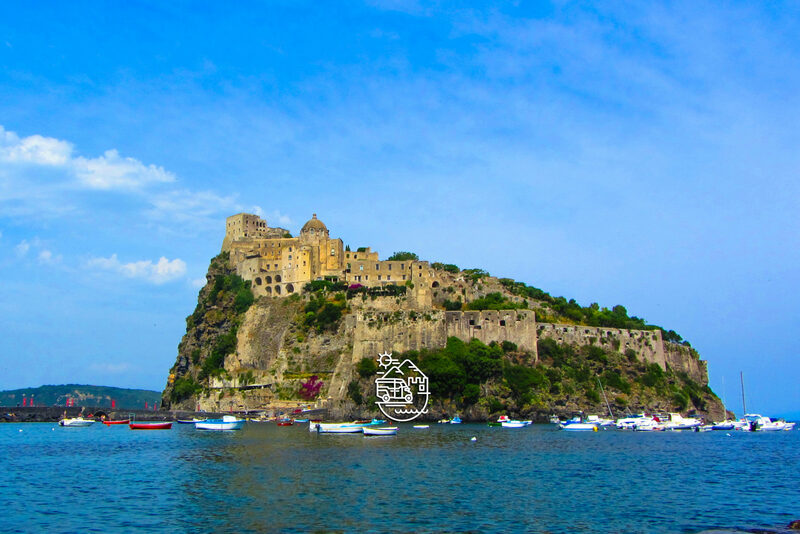 The park is a protected area for different species of animals and plants and from the top, you can enjoy a fantastic view of the Sorrento Peninsula, the Bay of Naples and the Island of Capri.